instead of off the grill? I've done it before for fun, but today it was a necessity. Yes, my oven decided to go on strike. What are the chances that two different gas ranges, in two different locations, would both have the oven ignitor break? The first oven issue happened almost 3 years ago while I was roasting squash. It ended up being an easy fix for Jared after Googling it and watching a YouTube video. 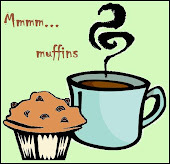 :) However, this time around the oven went out as I was prepping food to take to a family from church. I had French bread rising, cookies ready to bake, and tomato sauce simmering for lasagna. This was NOT the time I wanted my oven to go on strike! But, if you know me, I don't give up easily and I have learned to "improve, adapt, and overcome" from my dad. So I moved on to the gas grill. I figured it would be my best option since it has a built in thermometer. I got all but the last pan of cookies finished up on the grill only to have it run out of propane, which meant firing up the old Weber charcoal grill and having a go at baking bread on it (that's a story for another post). Anyway, the cookies turned out really good on the gas grill so here's my take on "grilled" cookies. 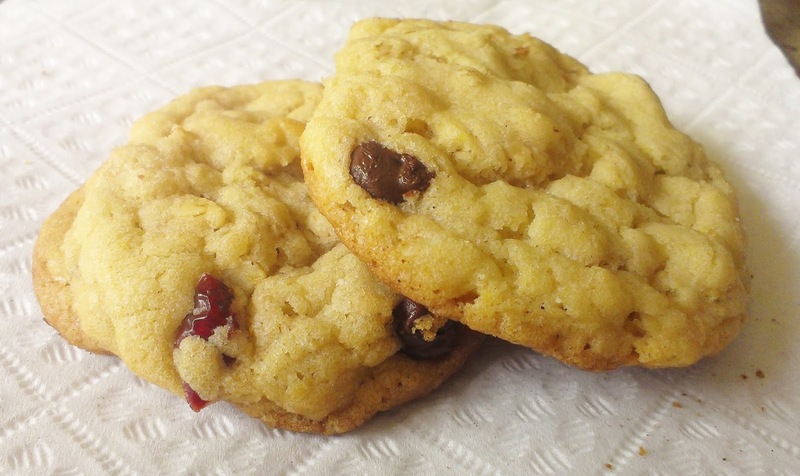 I have attempted only one cookie recipe (my Chocolate Chip Cookies), or variations of it, on the grill so I can't say that this method would definitely work with any cookie. However, if you follow these steps I would assume that you could use almost any cookie recipe. 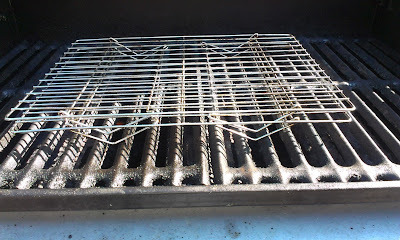 Step 1: If you are using your gas grill, be sure to even out the burners. On our grill, the burner closest to the propane source tends to heat up hotter than the burner furthest from the propane, so I usually turn the hottest burner down to low, the middle burner to just above low, and the coolest burn to a little hotter than the middle. You can see by looking at the flames how high to turn the burners up so they are even. 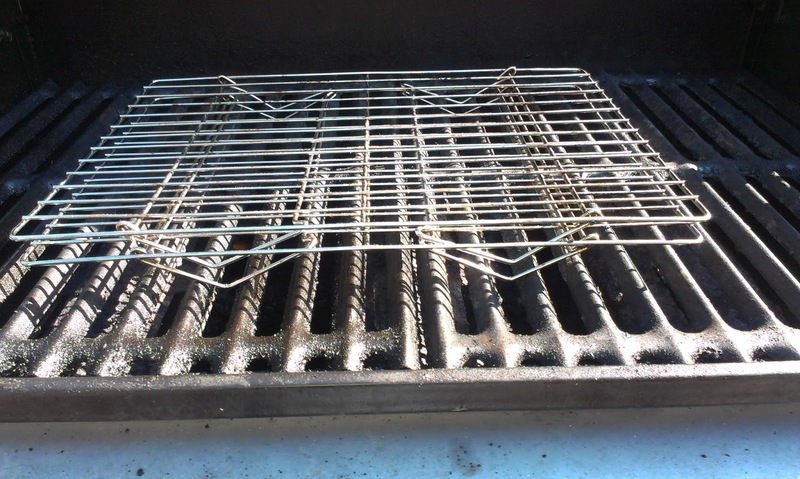 If you are attempting to use your charcoal grill, be sure that the coals are VERY evenly spread out along the bottom otherwise you will have burned cookies in the middle and underdone cookies along the edges. Step 2: Be sure there is a good amount of space between your pan and the actual flames or coals. I used 2 of my cooling racks stacked on top of each other but would probably use all 3 of them next time. Step 3: Keep your cookies small (no bigger than a tablespoon in size) so they can grill more evenly. The bigger cookies tended to be done on the bottoms and sides but doughier in the middle. Step 4: Check your temperature. 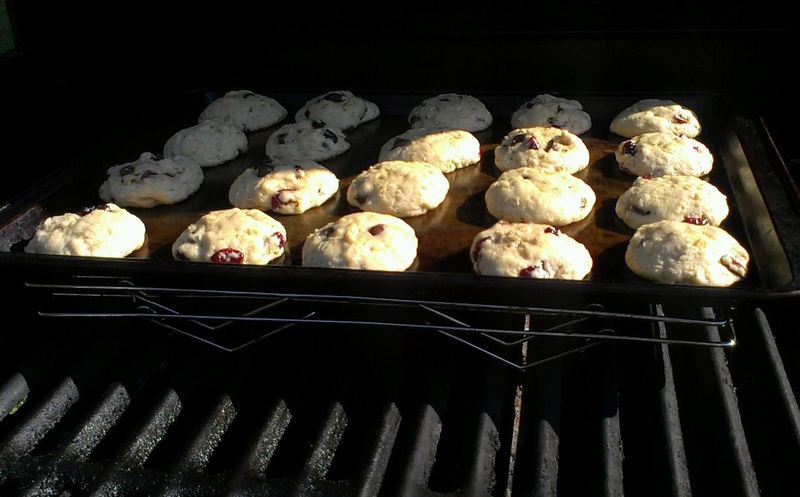 Our gas grill has a thermometer so I know when the temperature is just right for my cookies (325-350 degrees). With a charcoal grill, you have to go by trial and error, checking the cookies often until you have a time figured out. Unless of coarse you have an oven thermometer, infrared thermometer, etc. to check the temps. 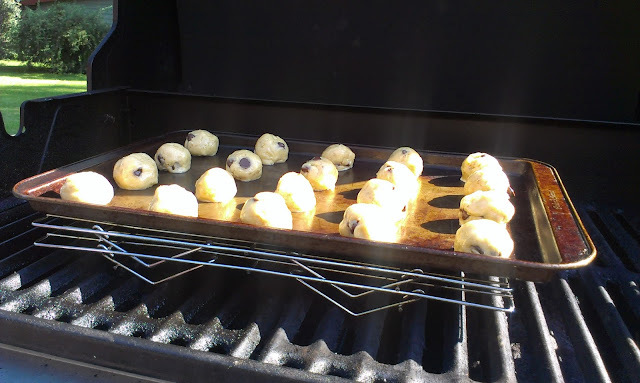 Step 5: Check your cookies often until you have the timing figured out for your grill. My gas grill cooks the cookies about 2 minutes faster than my oven. I'm not sure why, I just know it does. My charcoal grill varies quite a bit so I just plan to check my cookies after about 5 minutes, and then every couple of minutes until they're done. It is also safer to take your cookies out and let them finish "baking" on the hot plan than it is to leave the cookies on the grill when they are to that "almost done" stage. (you can usually tell by the edges of the cookie) and the middles look fairly firm. The Laundry Monster is tamed!